2) Speaking of parking, unless you want to wonder around like a fool (potentially in the dark), make careful note of where you parked. You can lose your bearings because there’s a chance you won’t exit where you entered, and it can be confusing. 3) Scott’s Roasting offers up a mean pork sandwich. I recommend the deluxe pork sandwich, which features barbeque sauce and coleslaw. They also raise the hogs, so it’s definitely local food. 4) Warn any first-timers ahead of time about the encampment portion of the fair. Most people at first find it very odd, but once they learn more about it, tend to find it to be a quaint tradition. 5) Canning a whole chicken in a jar is a thing, and you can win a ribbon for it at the Grange Fair. Another thing you might want to warn the people you are with about, before you enter the canning area. 6) You can find local food at Grange Fair, including Red Hawk Pepper’s fantastic hot sauces. Be sure to pick up a few bottles, it’s good stuff. 7) Arrive with cash on hand, not just for the food, etc., but also for the entry fee and parking fee. They don’t take cards. 8) If you are a first-timer, good idea to stop by the Administration Building and get information. 9) The Grange Fair also has a great website for those trying to find information such as schedules, where bathrooms are, and maps of the grounds. 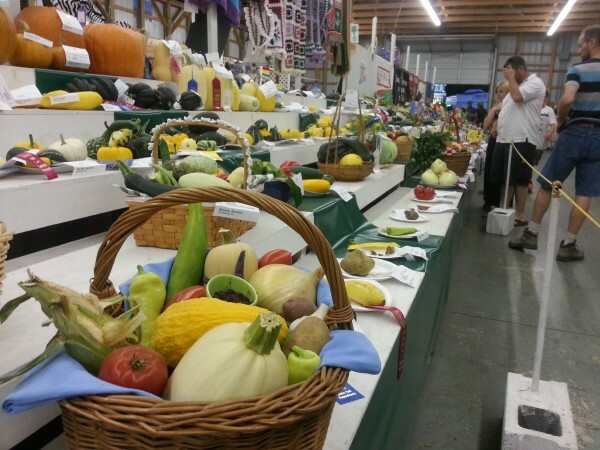 10) Plan to have dinner and/or lunch at the Grange Fair. And while there are the usual stomach-ache-but-worth-it carnival foods, there are also some interesting things to find that are local, such the hog maw plate at the Millheim Hotel’s stand. Nothing more Pennsylvania/local than that.